After WWI, the frantic pace of gun development that had seen caliber rise from 12" to a planned 18" in barely a decade plateaued, although work continued on mounts and mountings. One of the more interesting schemes of gun layout was that used on the British Nelson class, built under the Washington treaty. In an attempt to save weight by reducing the armored length of the ship, all three turrets were grouped together forward of the bridge. The second turret superfired over the other two, and the bridge was set very far back. Nelson and Rodney also deserve mention for their guns. For some reason, the British decided that it would be a good idea to build guns with light shells fired at high velocity. In practice, this didn't work, and the 16"/45 Mk I was only marginally better at piercing armor than the 15" that proceeded it. Worse, the muzzle velocity had to be reduced to increase barrel life, and the triple turret mountings were poorly designed, causing slow and inconsistent fire. There's an excellent essay on this turret on NavWeps. 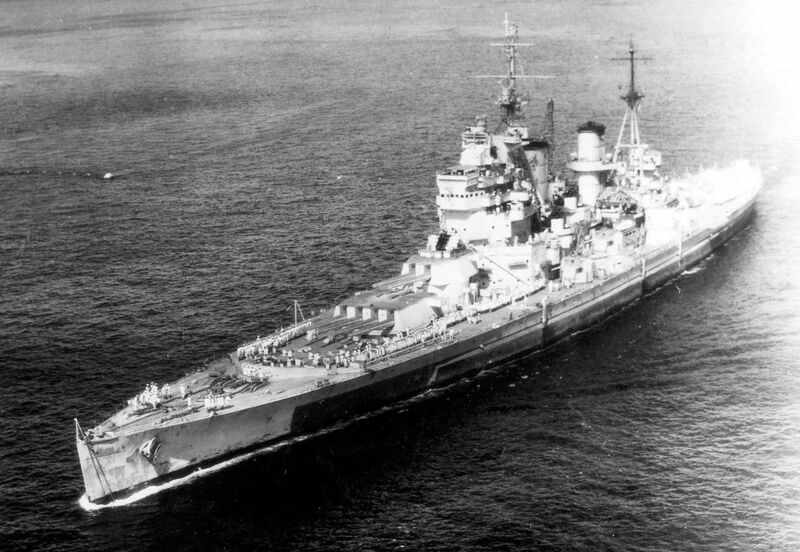 As they began to build ships in the 1930s, the French adopted an all-forward layout somewhat similar to Nelson, although both the Dunkerque class and the Richelieu class had only two quad turrets. These turrets were interesting, as they were essentially two twin turrets, each with a single slide, stuck together. This can be seen in the spacing of the guns in photographs. Most of the other battleships built under the treaty had the classic 2 triples forward and one aft arrangement. The only exceptions were Bismarck, due to Germany's generally retrograde approach to naval design, and King George V, which was originally supposed to have three quad 14" turrets, two forward and one aft.2 The second turret was switched to a twin when the armored deck was raised to keep the displacement from creeping over the 35,000 ton mark. The American North Carolina class was also designed with 3 quad 14" turrets, but the US decided to accept the delays when the escalator clauses3 in the 1936 London Naval Treaty allowed them to be changed for 16" triple turrets. Another WWII-era battleship that deserves mention on the armament front is the Japanese Yamato class, with their 40 cm/45 Type 89 guns. 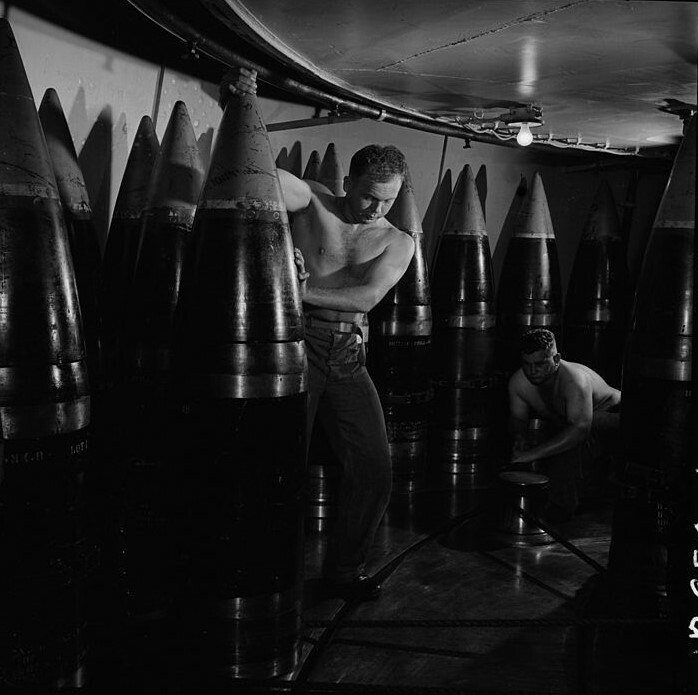 These guns were actually 18.1", but were called 40 cm/16" to conceal their actual size.4 These were the largest guns ever fitted aboard a battleship, although they were only fired at a surface target briefly during the Battle off Samar. While impressively large, these guns were mediocre in performance. As you should probably expect by now, we're going to close out this series with a look at Iowa's armament, the magnificent 16"/50 Mk 7. It was probably the finest heavy naval gun ever built, even though it was the result of one of the worst design screwups in the history of the American battleship. The previous American North Carolina and South Dakota classes had been armed with 16"/45 guns. When the escalator clauses came into effect, the US decided that it wanted to get more than an extra 6 kts out of the extra 10,000 tons allowed by the clause. The original plan was to use some of the 16"/50 Mk 2 guns left over from the ships canceled under the Washington Naval Treaty. These were perfectly good guns, and the Bureau of Construction & Repair (C&R), who were responsible for the ship itself, asked the Bureau of Ordnance (BuOrd), responsible for the turrets, for design sketches. BuOrd sent back several, including ones with barbette diameters of both 39'4" and 37'3". C&R, having trouble bringing the design in under the tonnage limit, decided to go with the smaller-diameter turret in April of 1938, for a savings of 825 tons. The AP shell had a muzzle velocity of 2500 ft/s when the gun was new, for a maximum range of 42,345 yds. When the gun was at average wear, the mv dropped to 2425 ft/s, for a range of 40,185 yds. 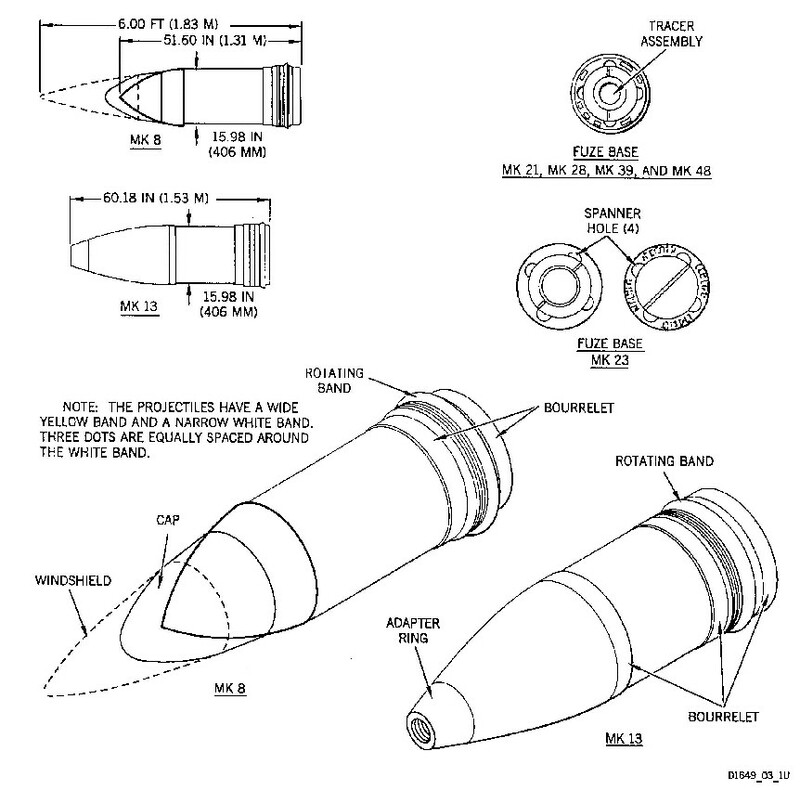 The HC shell came out slightly faster, 2690 ft/s from a new gun, but the lower sectional density made the range slightly shorter, at 41,662 yds.9 The guns were initially rated at 290 Equivalent Service Rounds, each equal to a full-charge AP shell. A full-charge HC round was .43 ESR, and a reduced-charge HC was .03 ESR. 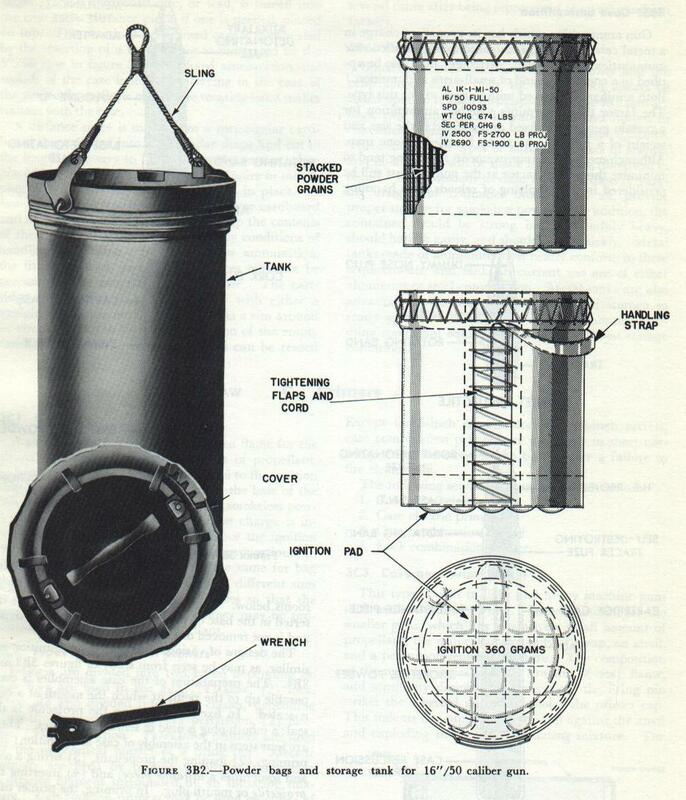 The life rose to 350 ESR due to a slight reduction in charge during the Korean War, and the use of what was known as "Swedish additive", made of titanium dioxide and wax, gave a fourfold increase during New Jersey's Vietnam deployment. During the 80s, a styrofoam jacket was added, which cut wear so much that the limiting factor in gun life became fatigue, with each liner capable of 1,500 Fatigue Equivalent Rounds. Each of the three guns was mounted in a separate slide, able to elevate to 45 degrees and depress to -2, at 12 deg/sec. The gun and breech could be removed from the slide and replaced without having to disassemble the turret. 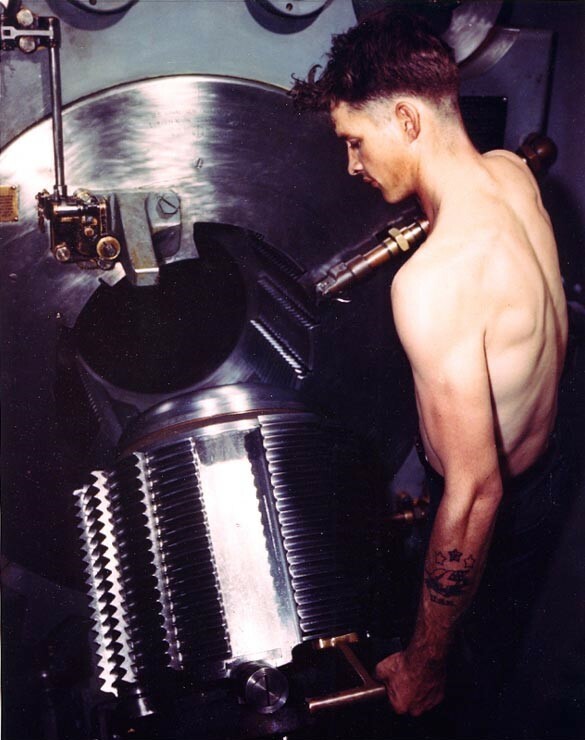 The breech was a Wellin-type, with a total of 15 sectors, 12 of them threaded. A 24-degree rotation locked or unlocked the breech. In common with most American heavy guns, the breech swung down, instead of to the side. The guns were fired by a charge of black powder in a blank cartridge case plugged into the breech, and ignited either electrically or by percussion. But the gun itself is only half of the picture. The machinery necessary to load and fire two rounds per minute out of each gun is equally important. American turrets were laid out somewhat differently from the British turrets we've looked at so far. Instead of being stored horizontally in shell bins, the shells are stored on their bases in rings that are partially inside the rotating structure. 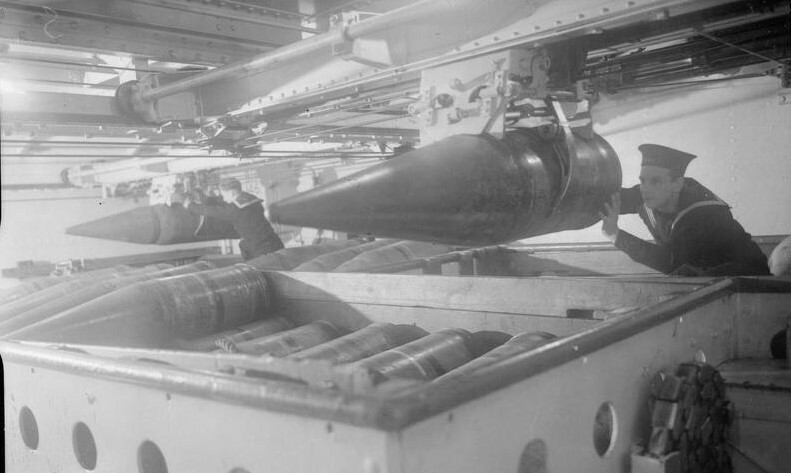 The shells are parbuckled into the hoists, and taken up vertically. When they reach the shell hoists, they're tipped over to horizontal, and the spanning tray is extended to bridge the gap. The shell is then rammed into the breech using the rammer's high-speed setting. 390 shells are provided for Turret I, 460 for Turret II,10 and 370 for Turret III. The powder was stored in metal tanks, each with three bags. These tanks were an important safety precaution in case there was an explosion onboard, as happened aboard Iowa in 1989. The tanks would be opened when the powder was needed, and the bags manually carried to the scuttles into the powder handling room. These scuttles were another part of the safety system, ensuring that there was never a direct path from the turret trunk into the powder flat. The powder bags were picked up and carried to the powder hoist cars. These ran from the flat to beside the spanning tray. After the shell was rammed, three bags were rolled from the elevator onto the tray. A gap was created, and the other three bags rolled out. These were then rammed at low speed. The breech was closed, and the gun sent a ton or so of steel towards the enemy at Mach 2. The crew then opened it, and repeated the process. In only 70 years, naval guns advanced from the 8" 68-pounder smoothbores of Warrior to the 16" 2700-pounder rifled breechloaders of Iowa. This was made possible by advances across many fields of technology, from metallurgy to mechanical engineering to ballistics to explosive chemistry. A tremendous amount of technical sophistication went into their design and operation, and I've only scratched the surface. 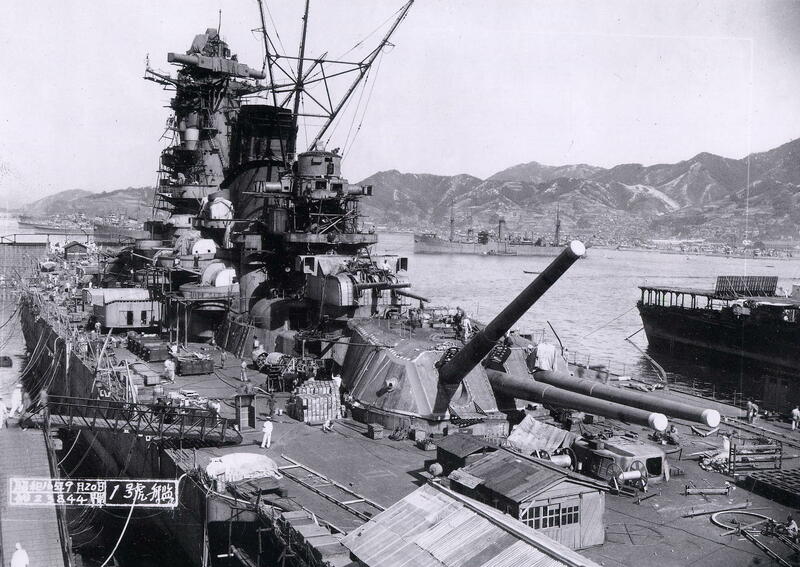 Ultimately, the big gun was the raison d etre of the battleship, as well as being a fascinating piece of technology. Why does the wake from the aft turret's firing appear larger than the wake from the two fore turrets? Is that just an issue of the aft turret firing slightly earlier? I'm pretty sure that the sequence was that Turret I fired early on, and the shockwave is fairly large by the time the picture was taken. This is the big fireball you see forward. Then Turret III fired, and both the shockwave and the fireball are pretty obvious. Turret II has just fired, with a smaller shockwave and brighter fireball that is blending into the one from Turret I. The most obvious-to-layperson limitation of Nelson's layout is the inability to fire directly aft. Since you don't even mention it, was this not a significant factor? End-on fire wasn't that important. You almost never fired within 20-30 degrees of fore and aft, because of blast damage and because it's not needed in the vast majority of tactical situations. The subject didn't seem to come up in the research I did for this post. That said, it might have pulled the British away from it in the 30s. The KGVs were wet forward because one of their design requirements was being able to fire the main guns directly forward at basically 0 elevation, so there was no flare to the bow. In practice, they never did this. It's possible that all-around fire was seen as more important then. Basically, if you're slower than the enemy, you can't get away from them anyway, so just turn the ship broadside-on (or steer toward them to close the range), and you can fire as you want. If you're faster than the enemy, then you usually want to be steering toward them to close the range and you can pick your angle of approach. Either way, stern-on fire is less important than bow-on or broadside fire. The US Navy did wargames in the 1920s(?) and decided that speed wasn't all that important, which is why US battleships were usually designed in the 22-25 knot range; the Iowas were intended as "fast BBs" to keep up with the carriers but what the Navy really wanted was the Montana class, basically a 4-turret Iowa with more armor and less speed. The US battlefleet from the Delawares to the end of the standards was 21 kts. The wargames were some time in the 1900s (decade), although US doctrine stayed pretty steady. Going into this more is high on my reading list. It's certainly not a topic I've sworn never to write on. My design histories are proceeding methodically, which suggests it may be a couple years. Anyway, IIRC the wargames showed that you really needed at least a 5-knot speed advantage to force crossing the enemy “T”, and that generally if you had a target in mind the enemy could either abandon the target to you or be forced to fight you to prevent you reaching it -- there was little practical need to out-speed the enemy fleet. Pretty much. The USN also had a bunch of recent armored cruisers to serve as a fast wing before and during WWI. They were scrapped under the treaty, and generally ignored as not being dreadnoughts, but they did play a major part in the thinking at the time. Sort of a strange question, but how do you think a modern 16" turret would compare? 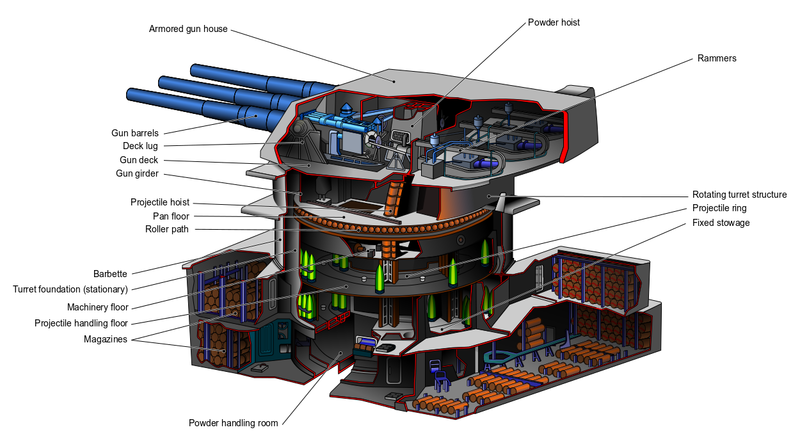 I realize the tactical use of a new battleship would be limited in the age of missiles, etc, but how much smaller could you make an equivalent system with modern metallurgy, more automation in the loading system, etc? Looking at land artillery suggests that the gross dimensions would be similar, but you might be able to cut weight by like 30% if you went with exotic materials and so on. Of course, if you can shrink part of the gun or its support infrastructure without losing functionality, that compounds itself, but that seems harder. It heavily depends on what you want to do with it. I think you're correct on the weight savings and inability to shrink the space. For the loading mechanism, we have two options. We could recreate the mechanisms described here, with minor improvements. This is likely to see some weight savings, but no real reduction in volume, and only minor crew savings. The problem there is that there isn't a good way to move heavy objects in a confined space with minimal manpower. The alternative is to automate it. You could attempt to do something like the 8"/55 semiautomatic off the Des Moines class. Or you could try to get the rate of fire way up, and replace the whole turret with a single barrel in the style of modern mounts, somewhat akin to the MCLG. But in both cases, we're doubling size, which has obvious problems. I'd love to see a 16" semi-automatic, but one begins to wonder just how much magazine space would be required to keep such a beast fed through a single engagement. one begins to wonder just how much magazine space would be required to keep such a beast fed through a single engagement. 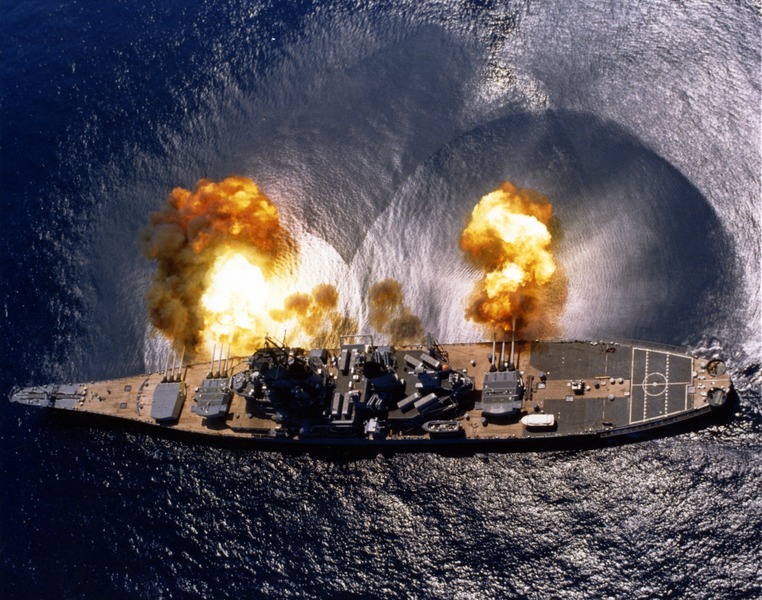 That was a major issue for the Des Moines class, and their shells only weighed an eighth of what Iowa's did. Also, how does spotting interact with single-gun turrets? And can modern technology make steerable AP shells so you don’t need to fire quite so many ranging rounds? I'd be a bit surprised if any modern 16" gun didn't use guided shells a fair bit of the time. Spotting is done by radar, and the shells can be clocked as they leave the guns, which improves accuracy immensely. Apparently, the 5" on a modern destroyer is basically capable of first-round hits on most surface targets within range. During the 80s, the Iowas were usually getting first-round hits on their targets. Good radar and laser rangefinders have made figuring out relative target location trivial, so you generally are going to want a much tighter pattern than would have been desirable back then. And without the need to use salvo spotting, a single capable of 6 rpm starts to look like a pretty good alternative to a 3-gun with 2 rpm per gun. Assuming, of course, that it works. Which is historically a major problem for this kind of gun. The 6" semi-auto had serious issues, as did most of the fastest 3" and 5" guns. Or you could try to get the rate of fire way up, and replace the whole turret with a single barrel in the style of modern mounts, somewhat akin to the MCLG. But in both cases, we’re doubling size, which has obvious problems. That seems like it would offer more room for improvement. Very interesting reading as well! And without the need to use salvo spotting, a single capable of 6 rpm starts to look like a pretty good alternative to a 3-gun with 2 rpm per gun. Would you start to run into cooling problems with the barrels and action? I think there was talk of putting water cooling into the Crusader to keep their rate of fire up. Did the Iowa's or other battleships have problems with sustained firing at max rate? Would you start to run into cooling problems with the barrels and action? I think there was talk of putting water cooling into the Crusader to keep their rate of fire up. 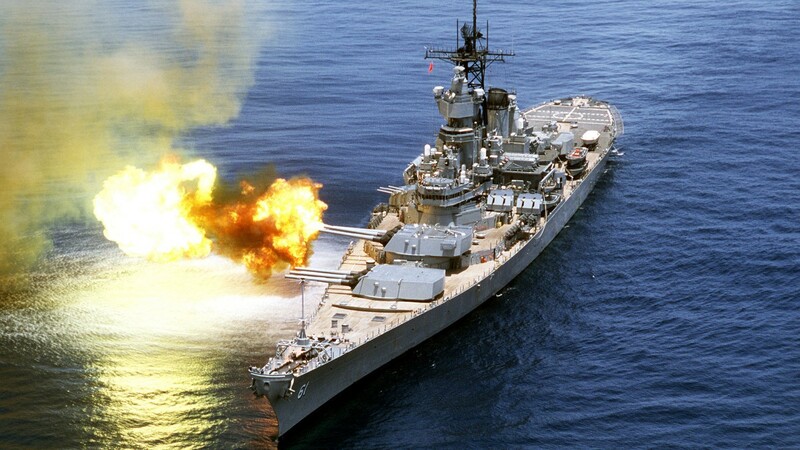 Did the Iowa’s or other battleships have problems with sustained firing at max rate? That's a good point. Assuming that all guns are scaled to each other, and that there's no heat loss, the only thing that's going to set heat limits is the number of rounds fired. Assuming that a reasonable amount of cooling takes place, then RoF is important. Even even discarding even scaling, it's hard to see a big slow-firing gun firing enough rounds fast enough to cause problems. But yes, I suspect that a fast 16" gun will need water cooling. 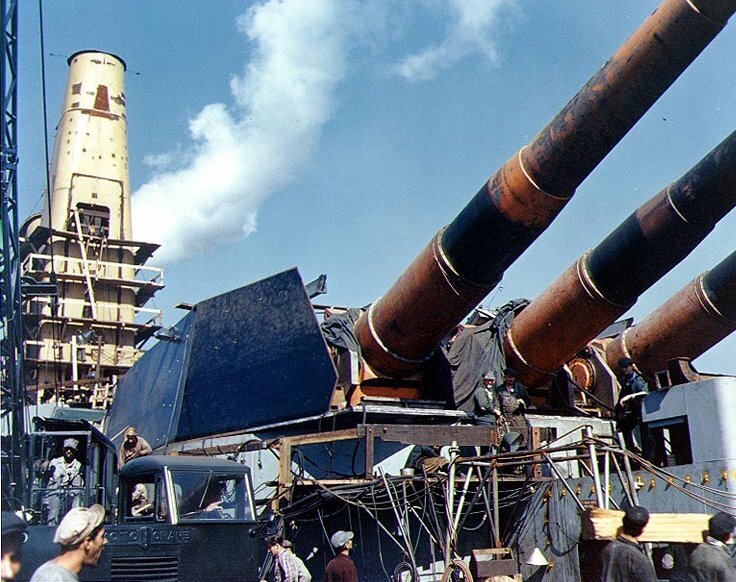 I've never heard of any cooling issues with battleship guns, and once a battleship, I believe it was Idaho, fired her guns dry at maximum rate.